The camshaft position sensor (G signal sensor) for the intake camshaft consists of a magnet and MRE (Magneto Resistance Element). The camshaft has a timing rotor for the camshaft position sensor. When the camshaft rotates, changes occur in the air gaps between the timing rotor and MRE, which affects the magnet. As a result, the resistance of the MRE material fluctuates. The camshaft position sensor converts the camshaft rotation data to pulse signals, uses the pulse signals to determine the camshaft angle, are sends it to the ECM. Then the ECM uses this data to control fuel injection time and injection timing. No camshaft position sensor signal to the ECM while cranking (2 trip detection logic). No camshaft position sensor signal to ECM at engine speed of 600 rpm or higher (1 trip detection logic). 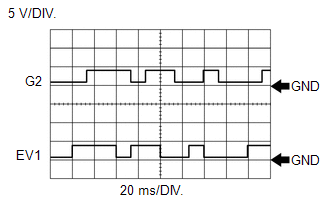 A missing camshaft position sensor signal despite the crankshaft position sensor inputs being normal at an engine speed of 600 rpm or higher (1 trip detection logic). 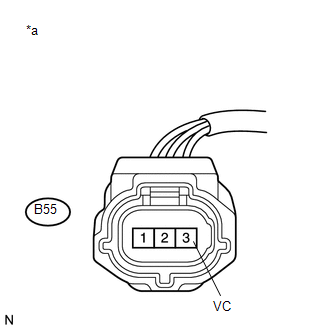 The output voltage of the camshaft position sensor is below 0.3 V for 4 seconds (1 trip detection logic). The output voltage is higher than 4.7 V for 4 seconds (1 trip detection logic). G2 stands for the camshaft position sensor (for intake camshaft) signal and EV1 stands for the camshaft position sensor (for exhaust camshaft) signal. If no signal is transmitted by the camshaft position sensor despite the camshaft revolving, or the rotation of the camshaft and the crankshaft is not synchronized, the ECM interprets this as a malfunction of the sensor. Input the DTC: P0340, P0342 or P0343. (a) Check the camshaft position sensor (for intake camshaft) installation. (a) Check the timing rotor of the intake camshaft. Perform "Inspection After Repair" after replacing the intake camshaft (See page ).